Update: Unfortunately, Tradewave shut down at the end of March, 2017. If you’ve got a few interesting ideas about cryptocurrency trading but still aren't completely sure how to test and make them profitable, Tradewave might be just what you need to turn those ideas into reality. 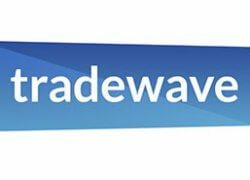 What's more, Tradewave is a great choice for both tech-savvy, experienced programmers and trading newbies. If you want to learn whether this algorithmic trading platform offers everything you need, continue reading our Tradewave review. Tradewave has been in the algorithmic trading business since January 2014. It’s based in New York and welcomes customers from all over the globe. Thanks to its excellent service, Tradewave has attracted numerous users since it was launched and the number keeps growing on a daily basis. You can join the platform for free and create highly efficient automated trading bots through free backtesting. There are also excellent paid plans that provide you with numerous benefits, from operating several trading bots at the same time to having the opportunity to reach the professional customer support staff 24/7. Tradewave is sponsored by Barry Silbert’s Digital Currency Group, which invested in BitPay, Coinbase, etc. Tradewave is an algorithmic trading platform suitable for both professional traders and beginners. The stated goal of the company is to bring automated trading to the masses by offering powerful tools that are easy to understand and use. 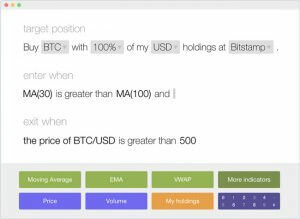 In case you’re not very familiar with automated cryptocurrency trading, you can skim through a long list of ready-made strategies and choose one or more strategies you like. Tradewave offers unlimited backtesting to all users, free and paid, so you can easily find a strategy that works best for you. If you feel that a strategy just needs some tweaking, you can make use of the handy editing option. On the other hand, you can also create your own trading strategy. Tradewave can help you build your automated trading bot in a few simple steps. For beginners, Tradewave provides Scribe, a visual strategy editor that accepts instructions in plain English. Once you make your first automated trading bot, you can backtest it across the extensive historical market data provided and involve it in live trading if it works well. Professionals gain access to Python IDE, an advanced editor for premium strategies. It works in a browser and makes order executions easier and simpler, especially when you combine it with Platform API. Apart from using its impressive library, Tradewave allows you to import Python standard library or a number of third-party libraries of your choice for additional convenience. Tradewave works with standard OHLC candles, whose data can be determined by tick intervals of your choice. Moreover, Tradewave supports minimum trading intervals of 1 minute. Once your cryptocurrency trading strategy is fully tested and ready for live trading, you can select the live exchange you want to use. You can find a list of supported cryptocurrency exchanges in the table below. The Tradewave live trading console provides a wealth of information, including real-time chart, log, and portfolio updates. You also get automatic updates on your strategy status via email. One of the major advantages of Tradewave is that it allows you to run your bots in the cloud. Thus, it eliminates common problems such as downtime and unnecessary load on your device. In case you need any additional information about Tradewave or algorithmic trading, you can check out useful guides on Tradewave’s website, join a discussion on one of its forums or contact customer support via email or phone. Tradewave offers 3 excellent subscription plans, so you can opt for the one that suits your needs and volume of preferred trading. You can choose between the Starter, Pro, and Gekko Plan. The Starter Plan provides 1 trading bot and an equity limit of $1.000. It costs $14 a month. 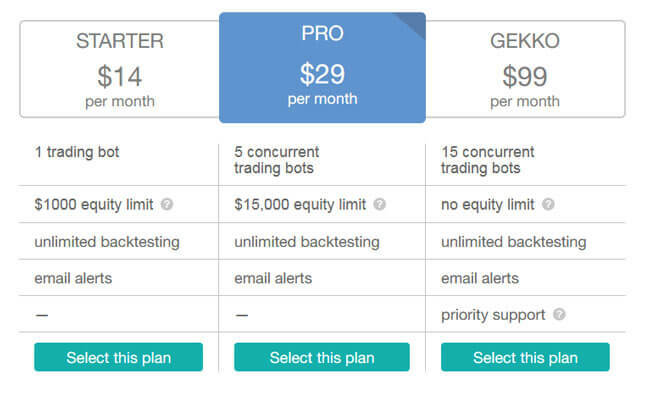 The Pro Plan comes with 5 trading bots that operate simultaneously and an equity limit of $15.000 for only $29 per month. The Gekko Plan is for high-volume traders. It allows you to use 15 trading bots at the same time and doesn’t limit your equity. In addition to that, you have priority when contacting customer support, which means that you’ll receive email responses much faster and be able to contact of one Tradewave’s engineers whenever needed. All plans provide you with 24/7 monitoring and hosting, email alerts, and the previously mentioned unlimited backtesting. Trading consoles keep track of your logs, provide real-time charts, and update your portfolio regularly. Also, you don’t have to sign a contract for any of these plans and yet you get a 7-day money back guarantee. However, you should be aware of the fact that every monthly subscription is automatically renewed unless you cancel it. Tradewave does its best to keep you safe while trading. Since cryptocurrency trading is unpredictable and many unexpected changes can occur, Tradewave reminds you to use your trading bots carefully. Tradewave can’t protect you from frauds initiated by any third party nor can it provide any refunds for your losses. When it comes to your account, you should keep in mind that you’re completely responsible for the security of your username and passwords. In case your profile is hacked or used by another person without your permission, you need to inform Tradewave at once so that it can take the necessary steps to protect your account. Finally, any trading strategy and source code you generate while using Tradewave is your intellectual property. Tradewave can only access your trading strategies and codes with your permission or in case of customer or technical support intervention, site maintenance or if it’s required by law. Tradewave can be a great first automated trading platform for a newbie or an advanced tool for experienced cryptocurrency traders. It gives you the opportunity to join live exchanges using ready-made trading strategies but also enables you to create one or several on your own. Research conducted for this Tradewave review has shown that this algorithmic trading platform performs very well, keeps your portfolio updated, and provides live charts without any delays. If you think it can be a good choice for you, you can create an account in just a few clicks. I like the freedom of making and testing strategies, especially because it’s so easy to create them with tradewave, but it’s not so great in live action. Great platform, charts are up to date and I’ve made 2 good purchases with my own bot already. It’s a good platform for pros, I’m all in. But be careful if you’re new, it can cost you a lot if you choose a bad strategy, and some of those on the website are darn rubbish. It was really ok, but then I got stuck and support still doesn’t seem to care. It’s been 2 days!